Although senior Kristina Vaculik missed this season’s first four meets due to an illness, the Stanford gymnast has since returned stronger than ever with the goals of clinching Regionals and Nationals berths. The Stanford Daily’s Elizabeth Trinh sat down with Vaculik to converse about her time at Stanford and the difference between competing in Canada and competing in the United States at a collegiate level. 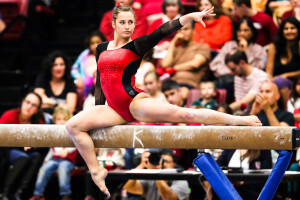 The Stanford Daily (TSD): How did you get started in competing in gymnastics? Kristina Vaculik (KV): So my mom put me in gymnastics when I was about 4 years old, I think, and that was just a fun day camp with my older brother. I tried doing other sports like soccer, but I wasn’t really into it. I just ended up doing cartwheels around the field, so that was an indicator to my mom that I should stick with gymnastics. TSD: What about gymnastics encouraged you to stick with the sport? KV: Every day presents its own challenge. It’s something I can never really get bored with, and you’ve also got to put so much into it to get something out — years and years of work to finally learn a skill or to win something at a competition. It takes a lot of devotion, and when you finally get that — just the feeling of pride — it’s great. And I also just love being able to get that weightless feeling when you do skills and feeling that self-accomplishment after learning something. TSD: Tell me about competing in Canada and why you ended up choosing to attend Stanford. KV: It’s kind of a long story. I didn’t really know about the whole NCAA U.S. scholarship athletics or anything like that because in Canada, there is no such system. So, that was all new to me. My main focus when I was in Canada in training as a high performance gymnast was going to the 2008 Olympics. Unfortunately, in 2007, we didn’t qualify a team in the World Championships for the Olympics, so we could only send two girls. At the time, I was one of the top gymnasts in the country, but just the way the system worked and how I was younger — we were meant to go on this World Cup Circuit to garner points based on how we ranked at those competitions. At the end of it all, I didn’t have enough points even though I was one of the best gymnasts in the country. That was really tough, and I had gone a whole year and more with an elbow injury, so that was a little bit heartbreaking. I was named alternate to the 2008 Olympics, but I had to pull out of that to get surgery on my arm. After that, I wasn’t too sure I even wanted to continue with gym, but then that’s when I started receiving these letters of interest from different schools in the States, and Stanford’s letter came a little bit after other schools. I think Utah reached out to me, and Washington, Maryland, Nebraska, Iowa and then Stanford. When I got Stanford’s letter, it was a real game-changer because I knew that Stanford’s athletic and academic programs were the best in the country, if not the world. So, I decided to go on an official visit, and I instantaneously fell in love with the campus. I met the team, and they showed me around. It was incredible, and I knew at that point that I wanted to come to Stanford. TSD: What has been your favorite gymnastics-related memory at Stanford? KV: This year, my last meet was just an amazing experience. My mom was here, and I had friends in the crowd. It was a nice finale to everything I had put into the sport at Stanford — seeing that support there. At the end of the competition, they put up a slideshow of when we were really little in the sport to everything we had accomplished and gone through at Stanford. That was really nice, but I’m not done yet because I have Regionals and Nationals coming up. TSD: Have you had any challenges in gymnastics at Stanford? KV: Being an elite gymnast is different from college. The level of performance is different because in college, it’s based on a perfect 10 system, whereas in elite, you can score over a 10, depending on how difficult your routines are and how cleanly you perform them. So it’s just a different training schedule as well because in college, you’re only allowed 20 hours. That was a little bit of an adjustment coming into Stanford. When I came in, I decided that because I had missed out of the 2008 Olympics, I wanted to go for 2012. I did my freshman year, and then deferred a year and took a leave of absence to go back home to train and regain National Team status in Canada. I went on to compete in the 2012 Championships leading up the Olympics, and we managed to qualify a team, so that was good. I made the team for the Olympics, which was an incredible experience. After that, I was able to come back to Stanford and readjust again to that lifestyle. I think it was a little challenging my freshman year, because on top of adjusting to this new college way of training in gymnastics, the team orientation was all new to me. I had been used to individual training and pushing myself. There wasn’t this whole team aspect to it. That was incredible. Learning about the whole team aspect and really immerse myself in that. I had the support for my teammates, and my coaches from home and my coaches at Stanford helped me along the way. It managed to work out. Following 2012, I came back to school. That was a little bit of an adjustment because I had a year off. Coming back, I decided that I wanted to go into Human Biology, so I did the HumBio core, and I learned how to do school again. TSD: Are you thinking about potentially competing in the 2016 Olympics? KV: No. I think I have done this sport for a long time. You can only do this sport for so long. Usually people who do elite gymnastics, their prime is in their 16s, 17s and 18s. TSD: What do you think distinguishes you different from your contemporaries? KV: I was trained by the 1980 Olympic champion, Yelena Davydova, from Russia. I guess her mindset and how she trained me was very technique-based and very strength-focused. I have more of a technical and classical look to me, and I can differently see it in my younger sister. She’s now competing for [the University of] Georgia. She’s a freshman. I guess that’s one thing that might be unique about me, or similar to people who were trained the same way. I was very lucky to have had that influence when I was very young, going into gymnastics. TSD: What are your post-graduation plans? KV: I am not too sure yet what I want to do following graduation. I am still trying to figure it out. I have plans to make it to medical school, so I am on that track. I am not too sure I am going to stay here this summer at Stanford or go back home. TSD: With this being your last season, do you have any parting words to your teammates? KV: Take in every moment. Realize how special it is — this whole experience. So many people wish to be here, and only so few people get in. You’re here for a reason because you’re chosen out of the many, so just realize that this is preparing you for the rest of your life. Beyond the athletics, you’re getting an incredible academic experience, as well. Immerse yourself in everything that you can, and take every moment to enjoy it to the fullest. Contact Elizabeth Trinh at entrinh ‘at’ stanford.edu.